Dogs get restless for a variety of reasons. Having a stressed out dog due to fireworks or thunderstorms is...well, stressful. Dale Edgar understood a calm dog is a content dog. That is why he formulated alcohol-free Calm K9 supplements with Chamomile. 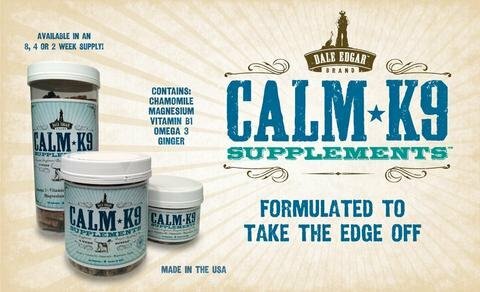 Dale Edgar's Calm K9 includes Ginger which soothes a dog's tummy during travel. Whether it's separation anxiety, trips to the groomer or vet, thunderstorms or fireworks, Calm K9 is formulated to naturally calm your pet so they can worry about what's really important... like what's for dinner! Unlike many supplements, dogs love the taste of Dale Edgar wafers made with banana, peanut butter, and honey. Try Calm K9. Your dog will be more content - we guarantee it! Apple Cider Vinegar, Banana Puree, Chia Seed, Himalayan Salt, Honey, Peanut Butter, Potassium Sorbate (a polyunsaturated fat used to preserve freshness), Rolled Oats, Vanilla Extract, Vitamin C (Ascorbic Acid).